FULTON, NY – In this giving time of the year thoughts often turn to making the holiday season a little more enjoyable for those in need. 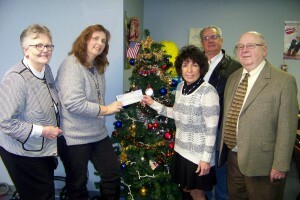 For the Oswego County Board of Realtors helping area homeless youth is its mission for the season. Representatives from the Oswego County Board of Realtors present Program Coordinator Karen Merrill, with a donation in support of Oswego County Opportunities PATH program. PATH provides homeless youth with transitional independent living services and assistance to help them become contributing members of society. From left are Flo Farley of Berkshire Hathaway CNY Realty; Karen Merrill, Marilyn Boyzuick of Century 21 Galloway Real Estate; Derek Woodmancy of Berkshire Hathaway CNY Realty; and Oswego County Board of Realtors Executive Officer Gene Friske. Absent from the photo are Mike LaFurney of Oswego County Appraisals, Patty Murray of Century 21 Galloway Real Estate, and Oswego County Board of Realtors President Connie Ryan of Century 21 Galloway Real Estate. Oswego County Opportunities (OCO) PATH program was once again the benefactor of the Oswego County Board of Realtors annual fundraiser. A transitional living program for homeless young people ages 16 – 21, PATH provides the opportunity for these young people to learn independent living skills, complete educational goals and become responsible members of the community. Friske added that in addition to their support of OCO’s PATH program, the Oswego County Board of Realtors also provides scholarship awards for 3 students from Oswego County High Schools. Established in 1991 PATH is entering its 25th year of providing services to young people in the community. For PATH Coordinator Karen Merrill it’s the support of caring individuals and organizations such as the Oswego County Board of Realtors that allow PATH to continue to offer services to homeless young people. “The continued support we receive from the Oswego County Board of Realtors is vital. Many of the funding sources have limitations as to what is allowed to be spent and holidays are not included. Thanks to the generosity of the Oswego County Board of Realtors we are able to provide those in the PATH program with a little something special at Christmas. For many, the presents we provide them with will be the only ones they receive. When their Christmas lists include items such as food, shoes and clothing it brings things into perspective. When many of these youth are asked to make a Christmas list, some of them have never been asked what they wanted for the holidays before and cannot recall many joyful memories concerning the holiday season. The homeless youth population continues to be a very misunderstood and many times, unjustly criticized population. The PATH program helps youth realize that they are members of the community and that their community supports them and acknowledges the positive things they are doing to better themselves many of our participants graduate from high school, attend college and obtain jobs,” said Merrill. The OCO PATH program is funded by the United Way of Greater Oswego County, Oswego City/County Youth Bureau, NYS Office of Temporary Disability Assistance and the Department of Health and Human Services. This article was supported by Grant Number 90CX6963 from the Department of Health and Human Services, Administration for Children and Families. Its contents are solely the responsibility of OCO and do not necessarily represent the official views of the Department of Health and Human Services, Administration for Children and Families. A non-profit agency, OCO will be celebrating 50 years of service in 2016. OCO offers more than 50 human service programs that serve more than 24,000 people each year. Operating in more than 80 locations throughout Oswego County, OCO’s workforce has more than 550 employees and 1,200 volunteers.